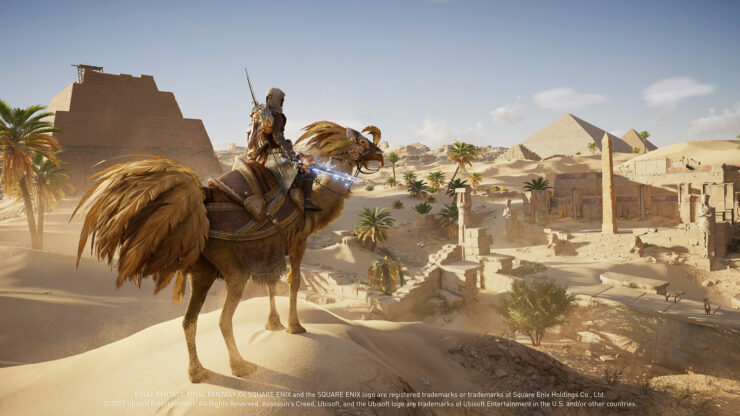 Assassin’s Creed Origins marked the comeback of Ubisoft’s trademark franchise. The game was appreciated by critics and gamers alike, selling very well so far. While the main content DLCs (those included with the Season Pass) haven’t been released yet, Ubisoft did add new stuff to Assassin’s Creed Origins recently, starting with a new Final Fantasy XV crossover quest. By solving a puzzle, you will be able to unlock two legendary items (Ultima Blade and Ziedrich Shield) and a Chocobo. That’s not all, though, as high level characters will be to tackle a Triumvirate of the Gods type of Trial, featuring Anubis, Sobek and Sekhmet. At this Trials of the Gods event, we have a very special challenge awaiting you in Assassin’s Creed Origins. During this week you can face all three gods: Anubis, Sobek, and Sekhmet! In this Trials of the Gods event, we’re also going to implement a Community Challenge! The Community Challenge is an objective set for the number of times the gods are beaten per platform. This Community Challenge will be across all three gods. Defeating one of them is enough to contribute to the objective, making you eligible to obtain the Community Challenge reward. You can contribute as many times as you want with any god you want to fight. You can find out if a Community Challenge is occurring by going to the Ubisoft Club tab in-game during a Trials of the Gods event week. To check community progress toward meeting the objective, head to the Ubisoft Club tab in-game or check via the Ubisoft Club mobile app. If the challenge is successfully met, all contributors will receive the Sunslayer Sword. To redeem your reward, go to the Ubisoft Club tab in-game or the Ubisoft Club mobile app. You will have six weeks after the challenge is completed to redeem your reward. Whereas in previous weeks you could only get one weapon from the Anubis gear set, this week you will have a chance to earn three (if you don’t already have them)! As with the previous trials, you will be awarded one item from the set you do not already own when you beat a god for the first time during the event period. If you choose to keep fighting the gods, you will continue to earn XP and Drachmas. Once you receive a total of four items from the set, you will be awarded the Anubis outfit! Show your allegiance to the Lord of the Duat by equipping this impressive garb. Trials of the Gods events will occur regularly in the future. They’re meant to give new challenges to endgame players – but don’t worry if you are not yet at a high enough level, there’s no need to rush! Continue enjoying the game at your own pace. All Trials of the Gods events will come back and rotate regularly, so you won’t miss out on this challenging activity or its unique rewards!